Apple has sent out an email to developers that are a member of Apple’s Mac Developer program, encouraging them to sign up for a Developer ID certificate. 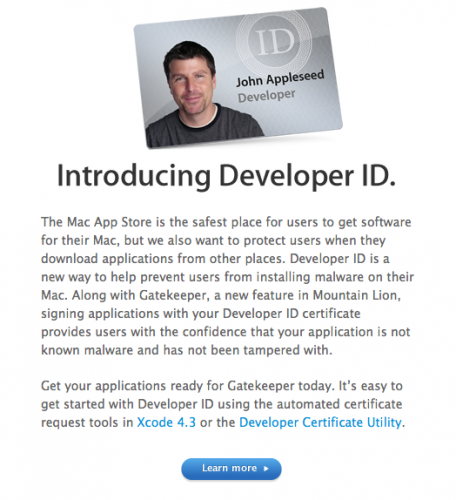 This certificate will enable developers to offer applications outside of the Mac App Store that will install on Macs running Apple’s new Mountain Lion OS. The new OS contains a feature called Gatekeeper which will eventually prevent any applications from being installed that are not signed with a Developer ID certificate. Gatekeeper may not be the solution to everything that ails the Mac App Store’s sandboxing and app restriction issues though. Developers are cautiously optimistic about the system, but some still point out that there are issues with Apple’s consumer-focused stance that may prevent their apps from being run on Mountain Lion at all, much less in the restrictive environment of the Mac App Store. Regardless, Apple feels that the Developer ID program is the right way to offer an alternative to those developers feeling the bite of sandboxing restrictions. If you’re a developer interested in the program, you can get more information here.